My little brother just become a father few days ago. My first instinct was to get the mother a gift. Most baby gifts are for the baby, not the mother. And it usually very functional gifts, you name it: baby socks, breast pumps, etc. But I want something different. So, I know my sister-in-law loves lipstick. So I get her 3 lipsticks and 1 cheek blush in shades that she used to wear plus some other adventurous colors. 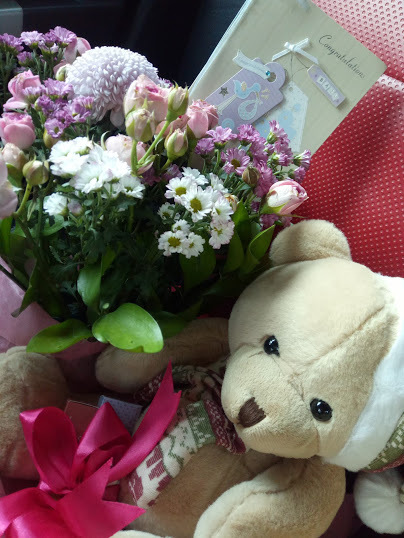 I also get her flowers and teddy bear for Baby Al. And guess what, she’s happy with the parcel!